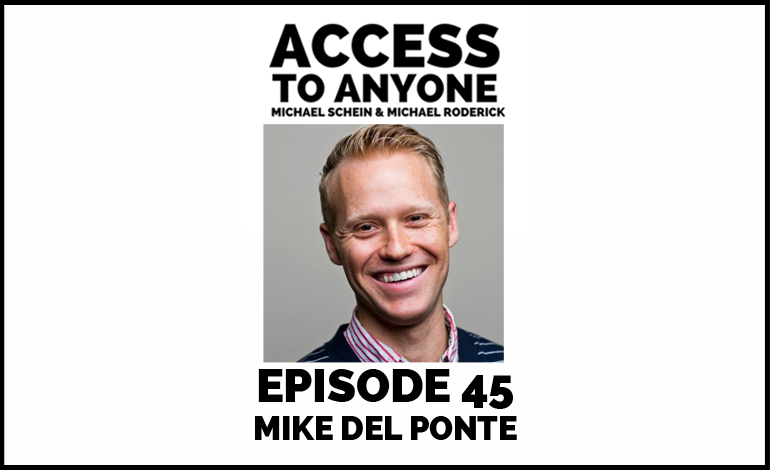 Mike Del Ponte went from nonprofit newcomer to one of the world’s top social innovators by building relationships with billionaires, celebrities, and other powerful people of various stripes. In other words, he has mastered the ability to make the kinds of connections most of us can only dream about. Today he reveals exactly how he does it. During the course of our conversation, Mike covers everything from mastering the cold-call (it can be done) to hobnobbing over cheap Indian dinners. As you’ll learn, truly effective networking comes down to living in the moment, creating positive energy, and embracing the things that make us who we are. Listen closely to this episode and take notes. It’s jam-packed with valuable information. How to make and maintain long-term relationships. Mike Del Ponte’s varied experience has resulted in creative ventures, unprecedented concepts, and a rich network of personal and professional relationships. He has won numerous awards (including the Financial Time Social Innovation Award) and has been recognized in the New York Times, Wall Street Journal, Fast Company, CNN, the Boston Globe, and other prominent media sources. Mike is also a keynote speaker who has told his story to audiences at Harvard Business School, Stanford University, the Social Capital Markets conference, and many others.